Since March I have been struggling with my weight loss. My mind hasn’t been focussed and I have managed to gain 10.5 lb in 2 months. I felt down and ashamed about gaining the weight but I stayed to group last Saturday and decided I was going to treat this week just gone as my first week at Slimming World. I planned meals for the week, shopped so I had plenty of super speed foods in the house and planned what syns I would eat daily but I paired my syns with super speed foods. I added salad to ever lunch time meal as I found I was craving sweets and chocolates in the evening and adding a salad to eat after noodles at lunch time curbed this craving. This Saturday I lost 4.5 lb, which is the most I have ever lost. I am happy to be back on track again but am a little concerned as I have a birthday coming up this week. I have decided to curb syns on other days so I can enjoy a birthday treat and to keep doing what I did last week to lose weight again this week. Concentrating on planning instead of beating myself up about eating too many syns was much more useful for my weight loss and is a lesson that will help me when I reach target too. what’s the food in the photo? I have to keep focussed to keep my weight down too, it’s so hard sometimes! 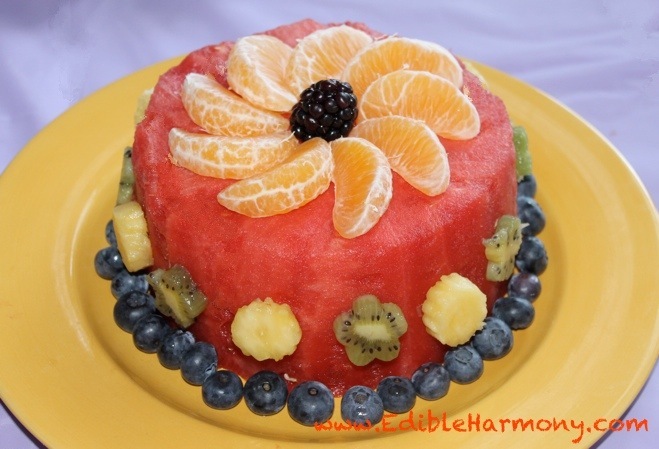 It’s a melon birthday cake. I doubt I’m going to be this good on my birthday this week but it’s there as visual inspiration to stay on track.